How to find working and non-working days for given month and year in Java? Home Date Interview Questions Medium Date Questions How to find working and non-working days for given month and year in Java? Write a program in Java that finds working and non-working days for given month and year with proper validations. As we know that working and non-working (Saturday and Sunday) days can be vary based on month and year. For example in Jan 2016, there are 21 working days and 10 non-working days but in Jan 2017, there are 22 working days and 9 non-working days. We are using following steps for writing code. Get month number and number of days in given month. Set month number to Calendar class constant MONTH and given year to constant YEAR. Run the loop until the number of days in given month. In the loop, set day number to Calendar class constant DAY_OF_MONTH and now this becomes our current date. Find what is the day on that date using Calendar class constant DAY_OF_WEEK. If its value is 1 or 7 then non-working day otherwise working day. Repeat step 4, 5 and count working and non-working days. How to find the number of days and weeks for given month? How to print every information about current date? * Adding all the dates related to given month and year to Calendar. * and checking day for each date. * If it is other than Saturday and Sunday then counting as a working day. * otherwise non working day. Output - How to find working and non-working days for given month and year in Java? 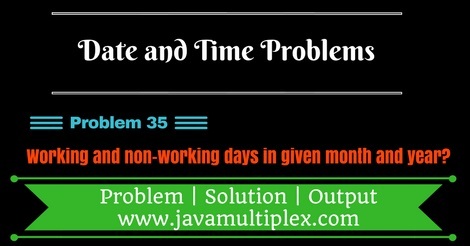 Tags : Date and Time problems, Working and non-working days in Java, Solution in Java, List, ArrayList, String, Regular expressions, switch statement, if else statement, Calendar, Leap year.